@Clark and I decided to build something to allow people an easier overview of existing Flarum extensions, maybe even create it as an extension integrated into Flarum. This is how Bazaar came into existence. Working behind the curtains of Bazaar is the web app flagrow.io, which loads newly published extensions, enriches them with logo's, descriptions and continues to monitor them for changes and new versions. All of this makes sense right? So what Clark and I discovered after having released our 20th crazy (and awesome) extension, is the increased workload in maintaining all of them. We therefore sought for a solution to make our efforts sustainable, initially we tried our luck with Patreon and failed miserably. Fast forward 18 months later, we are finally releasing new functionality inside our marketplace to offer any extension developer a way into sustainable extension development. Premium extensions are exquisite, quality and well maintained extensions you cannot install without a paid subscription. 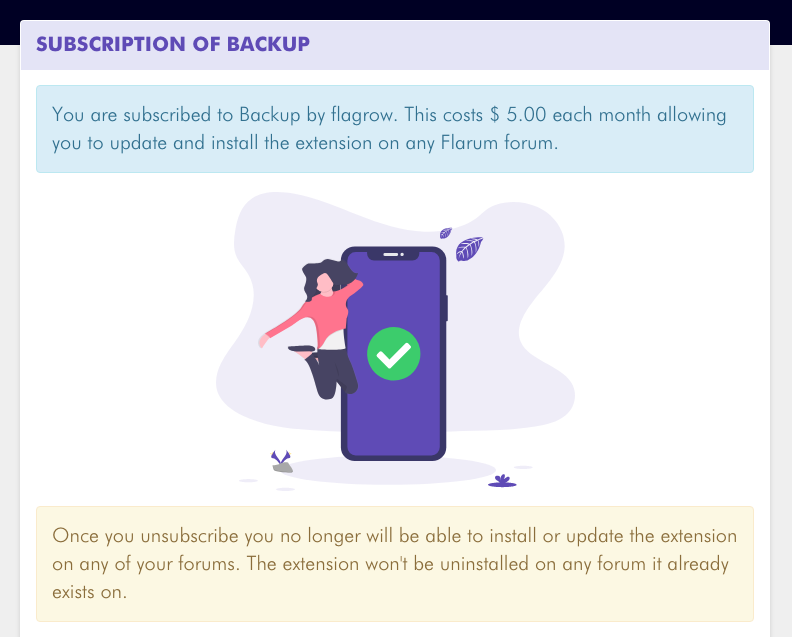 Once you subscribe to and install a premium extension, it will continue to work on that version of Flarum regardless of your subscription status. A continued subscription is necessary to retain access for future updates to premium extensions, to make sure you will always have the newest features and compatibility with the latest version of Flarum. From today forward you can discover these premium extensions inside your Bazaar or on flagrow.io. Existing extensions will remain untouched and available to you as usual. All premium extensions are reviewed beforehand in order to guarantee a standard level of quality and to prevent overlap. Please use this discussion for general feedback, join us on our forums or chat. In case you run into any issues with your premium extensions get in touch with us over email at "premium at flagrow.io". PS you can be notified of new free and premium extensions by following the flagrowio twitter account or from the #extensions channel on the official Flarum discord server. I remember watching the community for a long time; they were striving for it. As a result, their project collapsed. The reason is simple it does not work, the paid extensions that will make the purchase will be units. Developers are not profitable to support extensions for 3-6 customers, they just leave. I recommend that you change the policy of paid extensions. Let's start with the fact that the developer should have the right not to make updates or fix critical vulnerabilities if he does not need to. Problem number 2, extensions steal and distribute for free. If you created paid extensions, in a couple of hours it is already free. If the project will be popular and many people will use it, you will not be able to save extensions in a paid form. If you strive to create and receive passive income through extensions this does not work. The best option is to create a whole company to develop extensions for one person and create extensions only once and for one person. Still have an idea, all the extensions for one dollar, as did Steve Jobs with music. In any case, developers should have the right to not upgrade if they want. If you start banning developers for violating their rights on extensions, you will lose everything. I hope you find these tips useful. This has been a long time coming and on behalf of ReFlar I'd like to thank you and Flagrow for all your hard work! We have a few extensions planned for the platform and 1 that's coming super soon. We can't wait to show you what we have in store! Thank you for your feedback @Pirat. Sharing your experiences truly helps. It crossed our minds that premium extensions could be copied and republished for free, using source encryption would be a possible solution. However this is my reasoning. Giving users the source code for the versions they subscribed to made the most sense as open source enthusiasts. We are part of this community as much as those using our free and premium extensions. We spend hours upon hours towards making Flarum awesome. Time we invested to your benefit, time we will never be able to spend otherwise; with family, friends, for our careers.. We trust you with our extensions as much as we trust you to do what is right. The source code is still protected by the copyright of the author. Republishing them for free would be illegal. And even if you copy extensions, the real value of an extension lies not in its code, but in the people behind it. Before you consider republishing the hard work of other people, decide what team you are on. I hope others will see this as a great stimulant to Flarum extension development. gurjyot go to https://flagrow.io/extensions and toggle through the Premium filter. I'll make sure there's a direct entry somewhere in the future. gurjyot good point. I'll take that along for the redesign. This might shed more information on their usefulness 😅 .